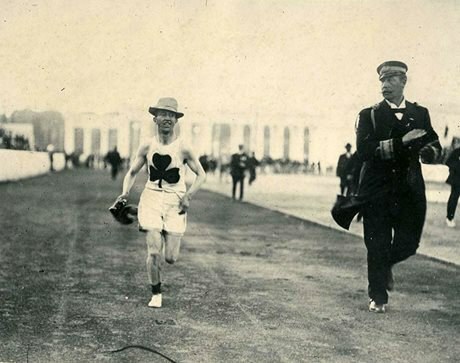 One of Canada's greatest Marathon runners, William "Billy" Sherring (1877-1964) was born in Hamilton. He began his athletic career as a member of the YMCA Boys Club. Sherring entered many county fair races and, in 1897, gained his first major success at Bartonville. Two years later, he recorded the first of two victories in the Around-the-Bay Road Race – one of the oldest long-distance road races in North America, now known as the Billy Sherring Memorial Road Race. His most memorable triumph, however, was the victory that earned him an Olympic gold medal in Athens, Greece on May 1, 1906. Visit the Ontario Heritage Trust provincial plaque in the main foyer of Hamilton City Hall, 71 Main Street West, Hamilton, Ontario. Read more about Sherring on Canada’s Sports Hall of Fame website. Learn more about Hamilton’s Around-the-Bay Road Race. Watch the video of Sherring being inducted into the Hamilton Sports Hall of Fame.